You might think a Thai bone broth is an exotic take on a regular bone broth. Some people just hear the word “Thai” in relation to food and automatically think of something super spicy. Well there’s no fiery hot chilies used in Thai bone broths. Soups, yes (though not all Thai soups are spicy). But not broths. In fact, there’s really nothing all that exotic about a Thai bone broth. It’s just as easy to make as a typical western bone broth, if not easier, and the end result is not that dramatically different between the two. However, there are some differences in how a Thai bone broth is made compared to a western one. Before I get to the recipe, let’s go over some defining characteristics of Thai bone broths and why you’d want to make one. Generally speaking, most Thai broths are simmered for about 1-4 hours. This shorter simmer time results in a fairly light and often times a clear broth (though not always). In part this is because traditionally many Thai soups are part of a larger meal with other courses. This is a lot different to the western approach which often encourages a super long and slow simmer well upwards of 12 hours for chicken and pork and as long as 48-72 hours for beef. These long simmer times result in a richer, more gelatinous broth. My travels in Thailand have certainly challenged my preconceived notions of what a bone broth is and how to make it. 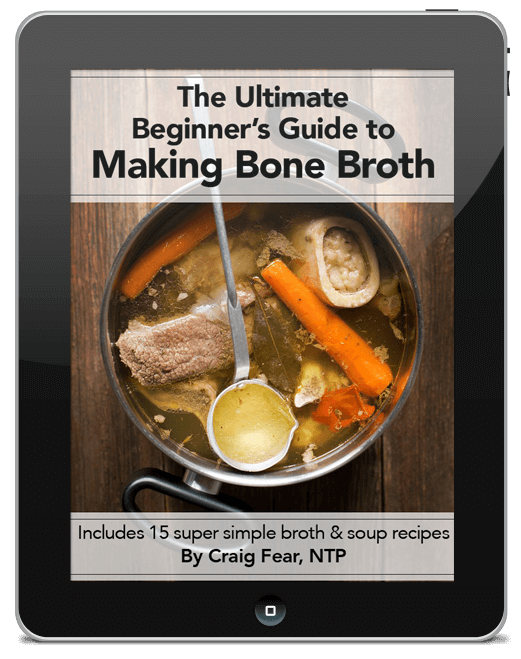 Previously, I assumed that the longer you simmer the bones, the better, as more nutrients will leach out over time. And while this is true, just because a broth is not gelatinous doesn’t mean it’s inferior in any way. Both long and slow simmered broths are inherently easy to digest and make for wonderful digestive tonics. 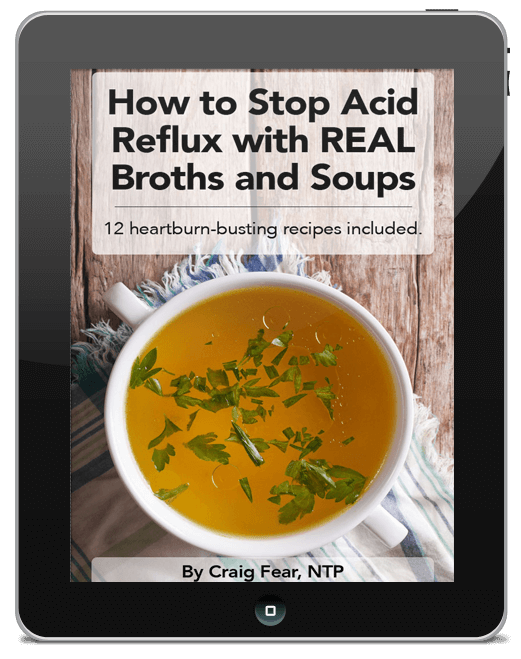 In fact, sometimes lighter broths can actually be easier on the body’s digestive system. 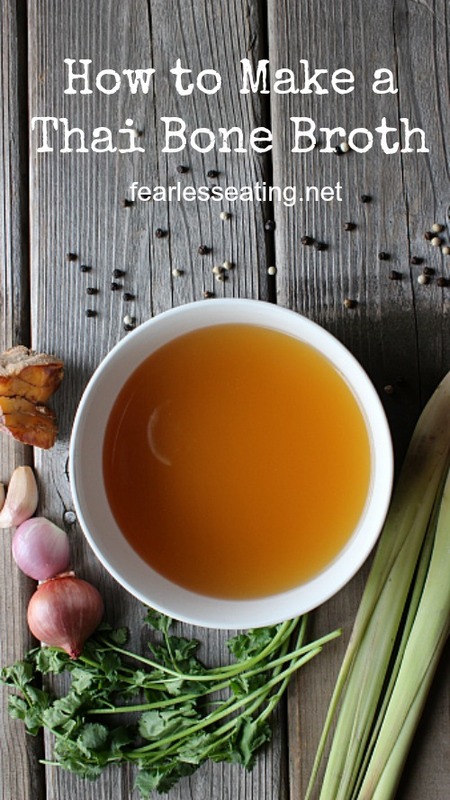 A previous post I wrote, When Bone Broth is Bad for You, will explain this in more detail. Another reason Thai broths tend not to be gelatinous is that larger bones from larger animals, such as cows, which inherently contain more collagen (which turns to gelatin when cooked), are not a commonly raised in Thailand. Even Thai chickens tend to be much smaller than the big meaty birds you’ll often find in other countries. Finally, sometimes the answers to these culinary questions are found in geography and climate. Keep in mind, Thailand is a mostly tropical country. This is just an educated guess but perhaps, prior to the advent of refrigeration, there was little use for gelatin-rich broths as the formation of gelatin requires cool temperatures at around 60 degrees Fahrenheit and below. Typically in the West, we make a bone broth first and then use that broth to make a soup later. But in Thailand, this is often done together in one step. So the bones are often simmered in water with the other soup ingredients and then the bones are discarded before serving. Or sometimes meaty bones like chicken thighs or pork ribs remain in the final soup recipe. We don’t often include cuts of meat with the bone on in soups in the West but this is very common in other countries, especially throughout Asia. That shouldn’t be shocking news, right? Instead of the common western addition of carrots, onions, and celery, Thai broths use things like lemongrass, ginger, galangal, Chinese celery, shallots, garlic, cilantro and other ingredients commonly used in Thailand. This gives Thai broths a distinct Thai flavor. 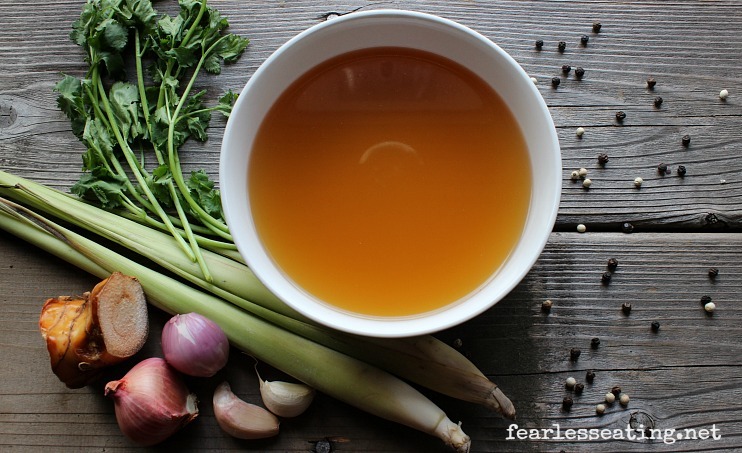 Why Make a Thai Bone Broth? Well because you might want to make a Thai soup! A Thai broth with notes of lemongrass, galangal, ginger and scallions makes a beautiful base for soups like the famous tom yum as well as hundreds more broth-based soups. Contrary to popular belief there are a ton of Thai soups beyond heavy and spicy coconut curries. But you won’t find many of these in western Thai restaurants. But you will find them in my new book, The Thai Soup Secret! The Thai Soup Secret includes 40 simple recipes which are al naturally gluten- and dairy-free. And when made with your own homemade bone broth (Thai or western style), they can support good gut health too. 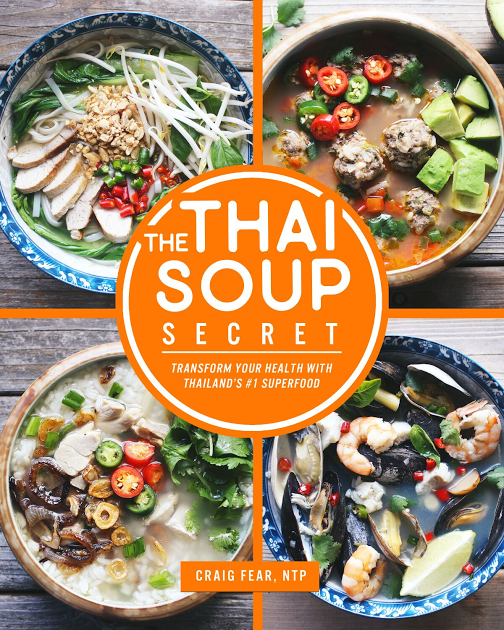 Click here to learn more and download a copy of The Thai Soup Secret! A simple infusion of water, bones and Thai herbs and vegetables. 1.Place bones in stockpot, cover with water by about 1-2 inches, bring to a boil and skim scum that rises to the surface. Cover and reduce heat to a very gentle simmer and add everything else. For chicken and pork simmer for 1-4 hours. For beef simmer for 2-4 hours. Let broth cool for a few hours and strain bones and other ingredients and transfer to storage containers. Store in fridge for up to 7 days and freeze whatever you won’t use within a week. 1.The only ingredient you might have to search for is lemongrass. I've noticed most Whole Foods stores now carry it. I've also seen it in my local health food co-op. Otherwise, any Asian market should carry lemongrass. If none of those are options for you, you can find fresh lemongrass on Amazon. 2. Cilantro roots are commonly used in Thai cuisine but are almost always trimmed off here in the west. No big deal. Just use regular cilantro with the stems attached. 3. Chinese celery is similar to our typical celery but the stalks are a lot thinner. You'll find Chinese celery at Asian markets. It's totally fine to skip it or sub regular celery. 4. Use black peppercorns for a little more zing in your broth. White peppercorns have a more floral, earthy flavor in comparison. Either one is fine and both are commonly used in Thai broths and soups. It's just a matter of preference. 5. Careful with the ginger! Too much and it can overpower the broth.